Now that Minecraft: Wii U Edition has been released for the Wii U, one would think that the tide of block based sandbox games on the eShop would be stemmed. 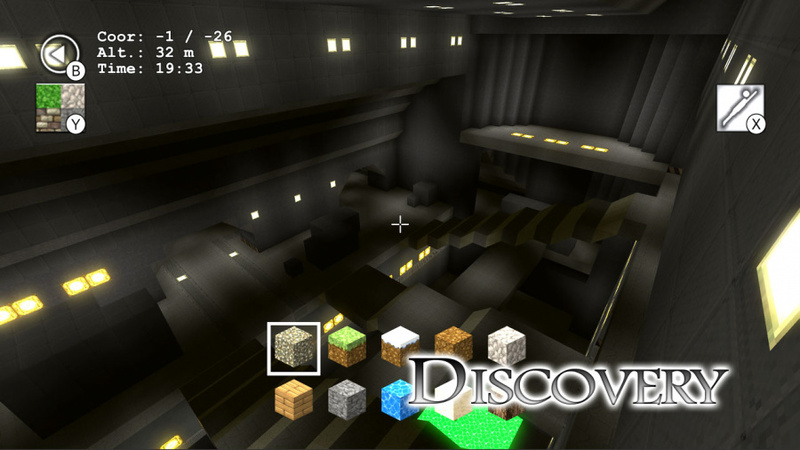 Evidently that's not the case quite yet, as Discovery is the next arrival on the Wii U eShop. So, how does the game stack up? While Discovery may feel a bit half-baked in terms of general content being offered, it nonetheless provides a solid (and affordable) alternative for those who just want want to be creative. 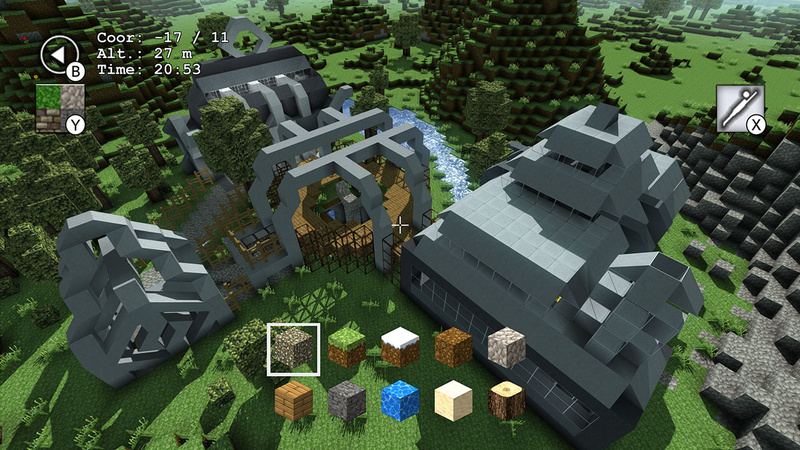 Visually speaking, this is probably the best looking cube sandbox game we've seen yet. 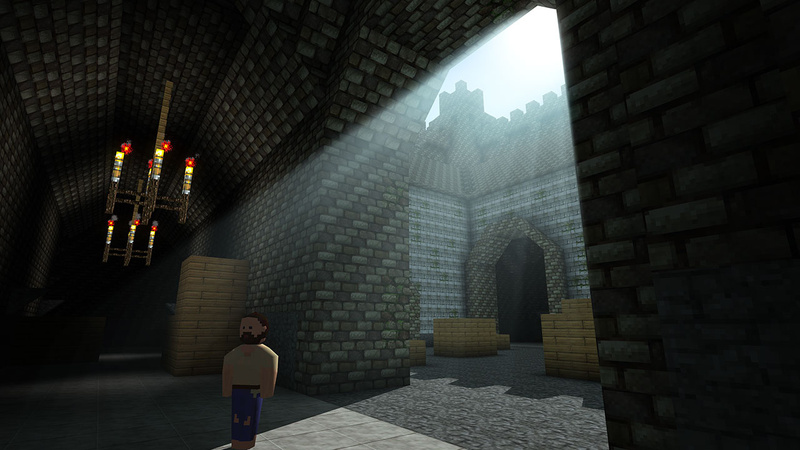 Yes, it even looks better than Minecraft, if only by a hair. Sunbeams stream in between the leaves of trees, the hue and colour of the sky changes according to the in-game hour, and the lighting and shadows have a semi-realistic quality to them. Draw distance is pretty solid as well, and what can't be displayed is masked by a blank fog. While the frame rate rarely makes 60 FPS and stutters now and then, it never dips to a point that it greatly affects the overall flow of gameplay. Pop-in is also a bit noticeable here when distant landforms are loaded in, but once again it isn't too invasive. In terms of gameplay, this is where the game will likely be a deal breaker for some. 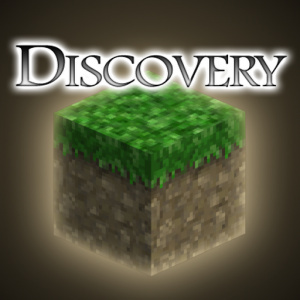 Essentially, Discovery is just the 'creative mode' that's present in most games in this genre, but it doesn't have any sort of 'survival mode'. That being said, what is here is a more than sufficient toolset for building whatever the heck you feel like. Maps can be generated as flat or with varied landscapes, and there are three different biomes possible. Slopes can be used in addition to various 90-degree items, which allows for a lot of variation in the design and look of structures that are built. Also, a friend can play locally with a Classic Controller Pro or Pro Controller, which can make projects that much easier to execute. A tap of a button will allow your character to toggle between flying and walking states and up to ten items at a time are available on a quick select menu. The full block set is another button press away, and features a standard assortment of wood, dirt, lava, stone, etc. A few animals - such as foxes and sheep - can be spawned in as well, but they don't blend very well with the environment; their rounded (and admittedly low poly) models clash with the angular look of everything else. As for GamePad integration, there is some, but perhaps not the way you imagined it. A bird's eye view of the map is displayed on the screen along with the coordinates and altitude of your current location. This is especially welcome considering the maps are well over one thousand square blocks, but it feel like more perhaps could've been done here. There's no inventory management whatsoever and there is no off-TV play, and this feels like something of a missed opportunity. The music is nothing to write home about, but it does a good job of filling the silence and giving the game a bit of atmosphere. There are some awkward periods in between songs where there's complete silence, but that's a nitpick and will likely only bother a very select number of individuals. While it would be nice to have a bit more variety in the soundtrack, there's nothing here that actively takes away from the overall experience. Discovery is a strong sandbox game that, in terms of creative options, arguably even manages to surpass the game it so clearly draws its inspiration from. That being said, many will no doubt be turned off by the lack of any sort of survival mode. We're giving Discovery a recommendation, but only to those of you who prefer spending more of your time building things instead of exploring caves and fighting monsters. For this price you won't find a better creative toolset, but bear in mind that's essentially all it is. aww i was hoping that this gotten a 7/10 to 8/10. oh well i'll give this and minecraft for wii u a shot. You're absolutely right. No survival is indeed a deal breaker for me. I actually got a computer for christmas, so I ended up buying the PC version of Minecraft for $27 over the more expensive lazy version we got on Wii U. However, if this had a survival mode, I probably would have bought it just to spite Mojang over the decision they made. Besides, this game looks to be technically and graphically superior to Minecraft. No survival is perfectly fine with me. Never play it on Minecraft, only interested in creative mode. So at 1000 x 1000 blocks, the world size is 4x the size of Minecraft on Wii U? Or did I misunderstand? If only it had gamepad inventory. One day, one of these clones is going to get it right. @A01 Apparently, the world size is infinite. I just went a thousand in one direction before turning back. I don't know exactly how far it is, but I think it's irrelevant; whichever way you choose to look at it, there's plenty of room! I was just interested how an indie dev managed to create much larger (possibly infinite) worlds, while Mojang and Microsoft can only manage 500 x 500. I like the lighting system used in this game. @A01 It's 864x864, actually. Only PS4 and Xbox One have the bigger worlds. Even 360 and PS3 had to settle for small worlds, and even then it's not that bad of a size. You'll never really end up exploring a world entirely anyway so it's fine. I wouldn't mind if it were slightly bigger though, not so much asking for PS4/One world sizes but a bit more would be alright. "Jumpin' jellyfish, what's that stench!?" No survival mode = no game to me. No GamePad support beyond a map. Shoot, not even Off-TV game play. Graphics better than Minecraft "only by a hair". Music "nothing to write home about". And this game still manages to get 6 out 10, ONE point fewer than Minecraft in most sites!?!?!? (here was 8) IMO, based on what i read, this game should be a 4 or no more than a 5 out of 10 if that. $6.99 huh? I guess is true what they say: "You get what you pay for". @A01 The Wii U port was developed quickly to make Christmas, remember the game had to go through a testing period by Nintendo - It is pretty much a perfect 360 port - a solid base to build on. Whilst disappointing to many I find the 864x864 worlds a decent size and the team seem eager to update and implement the innovative features of Wii U.
Alot of people disagree with my conclusion that Miyamoto was a massive block to Minecraft U - in as many words he pretty much said he didn't want it on the system in a polite way over the years. The reason the game went through in the 11th hour is due to his move to theme park direction. @Dark-Link73 I factored all that in when deciding a score, but ultimately, it seems this game was made for the purpose of offering a creative mode, which it does very well. There may be plenty of room for improvement, but it overall comes off to me as being slightly above average. 6/10 makes the game sound like a bad game (though the general way I see games scaled/rated is 7 as average/decent). For what is on offer (creative mode, more world space than minecraft, beautiful graphics) and a good price point (~1/4 of minecraft price? ), I'd have thought it should at least be 7/10 or inbetween 7-8, like 7.5 if that were possible (good quality of game per cost). The game looks great so I'll probably pick it up, my initial impression is that it seems a lot better than all the other minecraft clones. Granted, I haven't played many such games and survival mode has little appeal to me currently. Of this genre this game seems most appealing, played Terraria on PC and the survival aspect (endless hordes, high spawn rate) was annoying and too often interrupted the creative process. My initial impressions (have not tried Minecraft but seen a few vids. Just played some Stone Shire prior). As mentioned, some negatives, but I didn't care about the exclusion of most of them. -no survival mode so potentially less play time. Goal appears to be a focus on creativity and not grinding or interruptions from monsters, and it seems to have done really well in that. My initial play impression is 8.2 / 10, particularly if you care more about creating worlds over the other features. May have less gameplay time due to lack of grinding and monsters to survive, but for the price point it's a fairly high value for the money. For me, as I'm getting older I particularly dislike wasting time grinding. This game appears to be the perfect type of block sandbox for me (everything being unlocked, unlimited quantity, ability to move and place blocks freely). Does Nintendo Life recant reviews?Because if an update was made to this game that added survival mode,would they have to re examine it?